Have you heard about easyfundraising yet? It’s the easiest way to help raise money for South Essex Wildlife Hospital! If you already shop online with retailers such as Amazon, M&S, Argos, John Lewis, Comet, Vodafone, eBay, Boden and Play.com, then we need you to sign up for free to raise money while you shop! 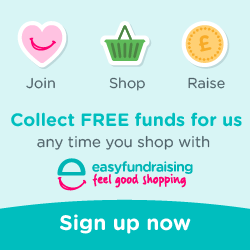 You shop directly with the retailer as you would normally, but if you sign up to http://www.easyfundraising.org.uk/causes/sewh for free and use the links on the easyfundraising site to take you to the retailer, then a percentage of whatever you spend comes directly to us at no extra cost to yourself. Spend £100 with M&S online or Amazon and you raise £2.50 for us. £100 with WH Smith puts £2.00 in our pocket and so on. There’s over 2,000 retailers on their site, and some of the donations can be as much as 15% of your purchase. We’ve just started with easyfundraising and haven’t raised anything yet, so we need your help to keep donations coming in. Sign up at http://www.easyfundraising.org.uk/causes/sewh and start making a difference…simply by shopping.